Wedding outfit rules and traditions - can they be broken? When it comes to planning a wedding there are so many traditions, rules and dos and don’ts and it can make it quite a stressful process! 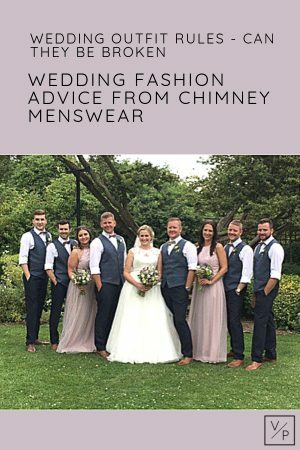 When it comes to wedding outfit rules we asked the lovely team at Chimney Menswear – “Can they be broken?” it is your wedding day, after all! Weddings are surrounded by rules and traditions but as styles of weddings change so these rules become open to interpretation. Does the Groom have to wear a jacket? Traditionally, no man could attend a wedding without wearing a jacket and especially would not be allowed into a church without one. With current trends, many ceremonies take place in a variety of venues and dress codes have changed dramatically. If the formal approach is not your style then consider leaving your jacket at home. Choose braces or a waistcoat, possibly one with a collar, and distinctive neckwear. 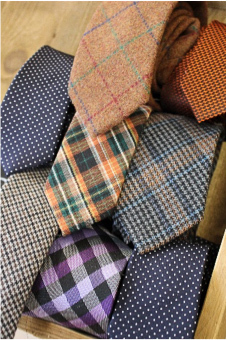 This is where a bow tie takes on a special roll and the style chosen can open up a huge range of possibilities. Do the men have to wear matching suits? Not if you don’t want to! Why not abandon your suit altogether and mix and match separates but keep a common colour running through to create a coordinated but individual look. 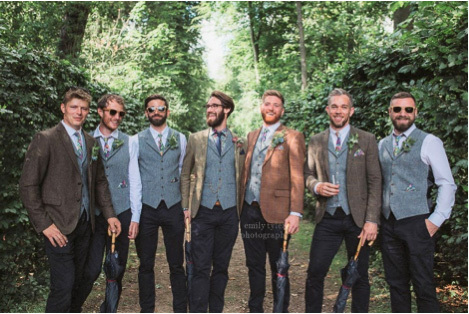 Choose a theme and mix colours that echo that theme as these guys did for their autumn wedding. Image courtesy of Emily Tyler Photography. Do buttonholes have to be made from flowers? A buttonhole is traditionally one or more flowers arranged with foliage, worn on the lapel of a jacket but this doesn’t have to be the case. Explore materials that work with the theme or feel of your wedding. Try foliage on it’s own or seed heads. One of the most effective alternatives is feathers which give a soft, informal feel and work extremely well with tweed and rustic or country weddings. Traditionally a wedding shirt is white. It shows off the neckwear colour and gives a clean, sharp base for a formal suit. If your suit is not too formal or you are wearing a waistcoat without a jacket, then the options are endless. So long as the overall look is not too busy or chaotic, choose patterns but remember to keep one colour running through from the pattern to the waistcoat and trousers too. Pale shades of pink and blue also enhance neckwear colours accentuating the overall look whether the colour theme is rose or wedgewood blue. Are there wedding outfit rules about the style of the tie or cravat? Plain colours give a sharp formal look. For a more relaxed occasion – patterns, whether floral, striped, spots or even textured tweed, may add that special touch you are looking for. Most formal shirts have double cuffs and so require cufflinks. Cufflinks add style to an outfit. When chosen carefully, can add personality to your look or even can express a special sentiment. However, a button cuff on a shirt may not look any less smart. 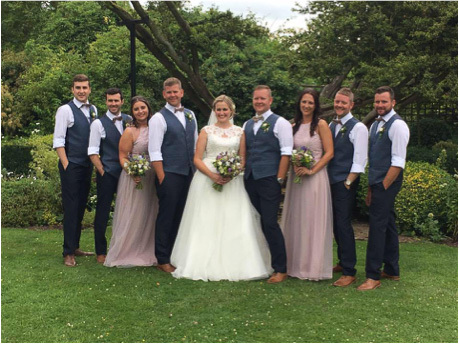 With the preference for more relaxed styles of weddings, a distinctive style can still be achieved by rolling up shirt sleeves and then worn with an individual style of waistcoat. In this case cufflinks are made redundant. Unique weddings personal to each couple are the best so don’t be afraid to do what you want to. Girls looking to make your own rules too? Check out our blog post featuring House of Ollichon Dressless Wedding Outfits!